The continuous calibration feature allows Motive to monitor and optimize the calibration quality continuously throughout captures. With this feature enabled, Motive can auto-adjust minor alterations or distortions on camera setups without re-calibrating the system over again. This ensures that the calibration will always be maintained at its best quality. In other words, the system can be calibrated once and you will no longer have to worry about external factors such as camera displacements, environmental vibrations, thermal expansions, or minor physical impacts; all of which may have gradually degraded the calibration quality before. This feature is supported for all OptiTrack camera models. See: Continuous Calibration for more information. With the introduction of the OptiTrack active components, OptiTrack's active tracking is now supported with more versatile features in Motive 2.0. The active tracking solution provides precise synchronization of camera exposures and active LED illuminations. This allows Motive to recognize illumination patterns and perform the active labeling of individual markers in real-time, and as a result, most stable rigid body tracking can be achieved. For more information, read through the Active Marker Tracking page. We have greatly improved the latency measurements both in Motive and in NatNet. Now, Motive measures and displays the overall system latency as well as the software latency in the Status Panel. In NatNet, latency metrics can be measured in between specific points from the processing pipeline. Please refer to the Latency Measurements page for more information. The rigid body refinement tool improves the quality of rigid body assets. When a rigid body is created in Motive, only a single frame of tracking data is referenced to define its expected marker locations. Now you can use this feature to sample multiple frames and refine locations of rigid body markers which in return improves the tracking quality of the rigid bodies. The HMD Calibration feature makes it way easier to prepare HMD Rigid Body assets in Motive. It utilizes both Oculus Tracker and Motive tracking to place and orient the rigid body pivot point at its proper location. 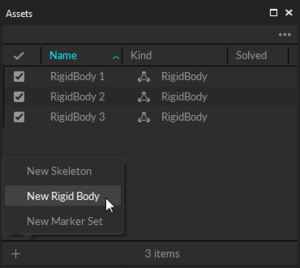 6 Rigidbody skeleton markerset provides full-body skeleton tracking using 6 rigid bodies that are placed on L/RHand, L/RFoot, Head, and Hip. Using the rigid body tracking data, the skeleton solves positions and orientations of individual body segments through inverse kinematics. In Motive 2.0, the functionality of the gizmo tools feature has been improved. Using the translate, rotate, and scale tools in Motive, users can make changes to the rigid body pivot points as well as segment size of skeleton assets. Gizmo tools (translate, rotate, and scale) from the perspective view. 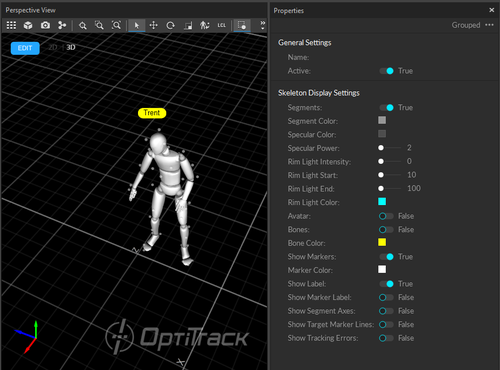 With the introduction of the new Data Management pane as well as the new Assets pane, moving asset definitions between Takes became much easier. For moving assets to a single take, you can simply drag and drop the assets from the Assets pane onto the Takes in the Data pane. For moving assets to multiple takes, you can select the takes and use the Copy Assets to Take feature to pick and move desired Assets from the current Take. Motive now supports tracking data export from multiple Takes at once. Synchronization with the AMTI force plates can now be accomplished per frame basis using the reference clock signal outputted by the eSync. For more information, read through AMTI Force Plate Setup#Synchronization. Motive now support integration of force plate systems that uses the AMTI Optima amplifiers. Additional hotkeys have been added to improve your motion capture workflow. Please learn and use them for a smoother workflow. One of the biggest change in Motive 2.0 is the redesign on some of the UI panes. The new design offers better organization for more efficient workflows. The Timeline pane has been divided into the following panes for easier monitoring of the data. 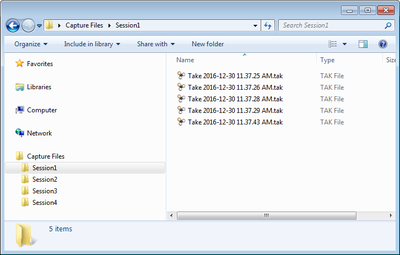 To provide users with better organization of capture files, the Take management section of the Project pane has been separated into a standalone pane named Data Management pane. There are tools that allow users to easily categorize, search, and manage recorded Takes for more convenient post-processing workflow. You can simply load or drag-and-drop session folders or Take files into the pane and manage them. The TTP project file format is deprecated starting from the 2.0 release. The TTP file format was a bit ambiguous and often a source of confusions when managing multiple Takes. Now, TTP file will be removed and the Takes will be managed by simply loading the session folders directly onto the new Data Management pane. For persisting the settings, the Application Profile XML files will replace the previous role of the TTP file. In these files, software configurations such as reconstruction settings, application settings, data streaming settings, and many other settings will be contained. Camera calibration will no longer be saved in TTP files, but they will be saved in the calibration file only. The asset management section of the Project pane has been factored out into the Assets pane. The new Assets pane is designed specifically for managing assets (rigid bodies, skeletons, markersets, force plates, etc.) in Motive. It lists out all of the assets involved in both live and recorded capture and allows users to manage them. This pane can be accessed under the View tab in Motive or by clicking icon on the main toolbar. The properties section that used to be located at the bottom of the project pane is now in a standalone Properties pane. The Properties pane lists out properties of selected objects in Motive. When a skeleton asset is selected, corresponding skeleton properties will be listed under this pane. Likewise, when a rigid body is selected, rigid body properties such as display properties and tracking algorithms will be listed. In Motive 2.0, new Markerset pane has been added specifically for management of the markerset assets. From the Markerset pane, you can create and manage a list of marker labels and use them in the Labeling pane for labeling individual markers. The rigid body pane contains three main functionalities for rigid body assets in Motive. It can be used to configure the default creation properties for newly created rigid body assets. Furthermore, real-time tracking data can be live-monitored under the Real-Time Info tab, and location of the rigid body pivot points of a selected rigid body can be translated and rotated under the Transformation tab. The functionalities for recording and playback have been factored into a separate panel that will always be docked at the bottom of Motive. Using the control deck, users can record new captures or playback recorded Takes. The status popover located on the right corner of the control deck replaces the status bar and allows users to monitor system operations. Status Panel can be accessed from the Control Deck. This panel reports system statuses, which were reported under the status bar in previous releases. 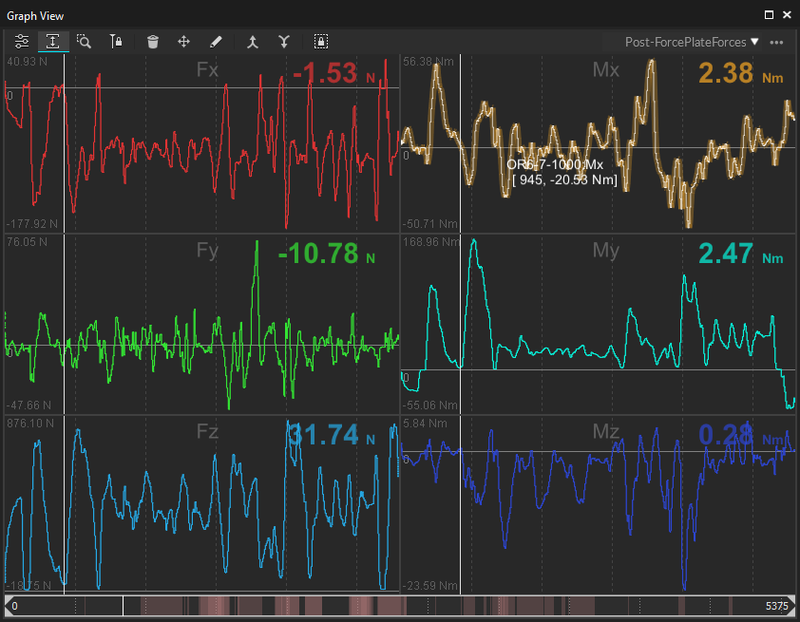 New graph's view pane offers several features that allow monitoring of the recorded data. more flexible features for viewing the recorded data. Custom graph layouts can be created, and users can configure the layouts for plotting specific data channels, including force plate data, marker trajectory data, rigid body orientation/position data, and analog data collected by NI-DAQ devices. This page was last modified on 16 November 2018, at 10:58.